Did Harambe have to die to save a human life? Harambe the western lowland gorilla looked magnificent in pictures. It’s a pity and a shame that he’s dead. It is utterly devastating to be reminded that he was murdered for no fault of his. And sickeningly haunting to imagine that he might have been killed because we, in our finite capacity for empathy as humans, misread and misunderstood his intentions. Whatever be the case, as crowds panicked and heckled Harambe, he swished the boy around the moat. A close look at the video footage suggests that the colossal ape was still being gentle, for a creature of its size with malevolent or destructive intent would have made quick work of finishing off an intruder of any size, leave alone a three-year-old boy. Some bystanders told media that the gorilla appeared to be protecting the child. The zoo authorities called in a gunman who put the great ape out with a single round from a rifle while the animal was still holding the boy. The zoo director went on record to say that although they were devastated by Harambe’s death, he felt they had done the right thing as tranquilizers would have delayed and perhaps compromised the desired outcome – the boy’s safety. And that’s how Harambe, who had celebrated his 17th birthday on Friday, May 27, became a victim of human negligence and folly just one day into his eighteenth year. The boy survived with all his bones intact, save a few bruises that may have been caused by his fall into the enclosure rather than by Harambe’s handling of him. Harambe, posthumously, has become an internet martyr — hero and victim both. Hashtags trended. Google searches of his name soared. On Facebook, parents and animal lovers, some straddling both camps, squabbled and ranted and preached and wept and satiated themselves on clicktivism. Soon, they will forget Harambe. Soon, we will forget Harambe. I have never been to the Cincinnati Zoo, so I can’t comment firsthand on the structure of the enclosure for Western Lowland Gorillas. But I have seen gorillas inside enclosures in a number of zoos around the world, and the sight isn’t uplifting. 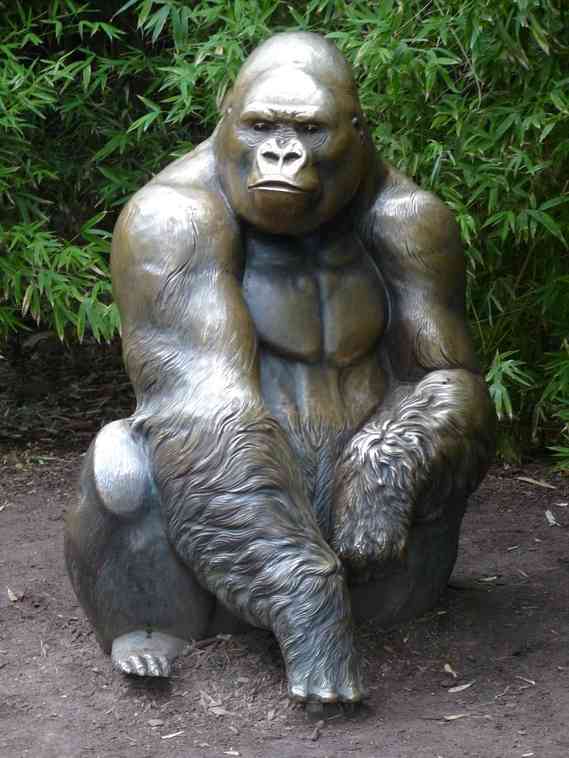 However prettified, spacious and naturally recreated the landscaping may be, in a zoo gorillas are still prisoners. They are inmates. Decisions about their food, their mates and their freedom are made for them by their captors, however benign and benevolent they may be. And, being higher primates, gorillas are probably sentient enough to understand this. This can make them temperamental and, even to their trained and familiar handlers, rather unpredictable. Which may explain why zoo officials made a decision to shoot and kill Harambe in order to save the little boy’s life. This is not the first of such incidents and, as long as human greed and stupidity are allowed to triumph over the fundamental rights of our fellow denizens of the Ark, it will not be the last. Being viewed by human visitors in a zoo can be stressful for animals, particularly territorial great apes. 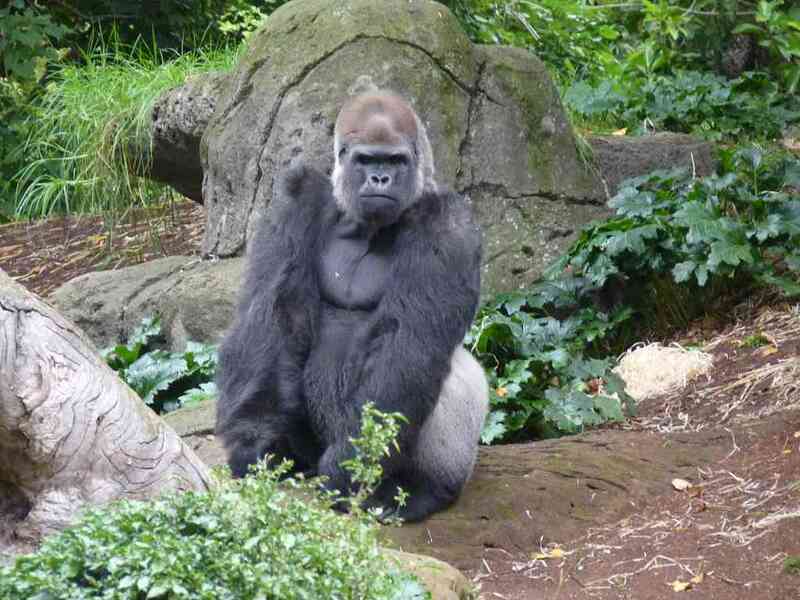 In 2007, Bokito, a male Western Gorilla at the Rotterdam Zoo, escaped from his enclosure and attacked a 57-year-old woman who was known to be a regular visitor. Video footage taken months before the attack showed the woman touching the glass wall of the enclosure and smiling at the gorilla. She meant well, we assume, but she was also rather daft in ignoring the animal’s messages. For those who have not watched Animal Planet assiduously, here’s a tip: making eye contact with any territorial animal and, in this case, baring your teeth to smile at an adult male silverback, can be a monumentally idiotic thing to do. Baring teeth, among primates like chimpanzees and gorillas, is understood to be a threat display. The zoo authorities should have posted explicit signs explaining do’s and don’ts to observe in the presence of gorillas, although such wisdom is usually retrospective. May hasn’t been a good month for zoo animals. On May 22, at the city zoo in Santiago, Chile, a delusional man stripped off his clothes and entered the enclosure for lions, muttering passages from Christian scriptures. The cats, true to instinct, pounced on him and began to “play” with him, according to eyewitness reports. Zoo officials shot and killed two lions — a male and a female — to save the life of the man, who is now recovering in hospital with serious injuries (and arguably no improvement to his mental condition). In September 2014, a man of similar mental makeup jumped into the enclosure of a white tiger at Delhi Zoo. Video footage of the incident showed the young man gesticulating to the tiger in a “begging” motion. The tiger watched the intruder for about 15 minutes, then began to paw him gently. When crowds began to harry the beast and pelt it with stones (apparently in a foolhardy attempt to distract it and save the man’s life), the tiger grabbed the man by the neck and dragged him away as a cat would a chew-toy it is playing with. Needless to say, the man died. The tiger was kept under observation but it was not put down. In fact, help never arrived despite there being enough time to take action. In due course, the male tiger went on to father a litter of white cubs. May his tribe increase! If zoos can’t keep people away from animals and animals away from people, they should be shut down. Humans in general lack an understanding of the objective of maintaining zoos, and most zoos are to blame for not clearly justifying and communicating their reason for existence, mostly because they themselves are in doubt about this purpose. The zoo as a menagerie for public amusement is a medieval idea that should be consigned to history. Tragically, it is not. There still exist zoos in the world where animals are confined in cramped, unhygienic and unsafe living conditions. They are malnourished, diseased and incarcerated. To boot, they are teased, taunted and abused by visitors who have paid a ticket price for the privilege of doing so. Gerald Durrell, author of many hilariously wise books on adventures with animals, was dead serious about his mission — the conservation of endangered species. Appalled by the lack of sensitivity to this aspect in the zoos of his time, Durrell began writing books based on his extraordinary adventures to raise funds for his dream project — a zoo where animals would be housed not as objects of amusement but with the aim of reintroducing them into the wild if and when conditions for their survival became amenable. Durrell’s vision and philosophy for the zoo is as a refuge where species threatened by poaching and habitat destruction in the wild can be bred in captivity. Zoos ought to perform that function and several zoos have established successful captive breeding programmes for their endangered inmates. Unfortunately, there is pressure to raise funds, be profitable and to entertain tourists. And this, as in the cases described above, often goes too far. While one faction of humanity is busy stripping the planet bare of forests, the Ark needs to be kept ready for a time when things improve, if and when they do. Last month I was in Semenggoh Wildlife Centre, an orangutan sanctuary in Sarawak, eastern Malaysia. The orangutans belonged to populations rescued from poachers and rainforest habitats lost to logging and deforestation. Over the last two decades, they have been encouraged to return to the wild, except that there isn’t much ‘wild’ left. Therefore, food must be laid out every day for some of them. Humans have created the necessity for zoos, even those that function in the right spirit. The problem we have to fix is therefore a far bigger one. 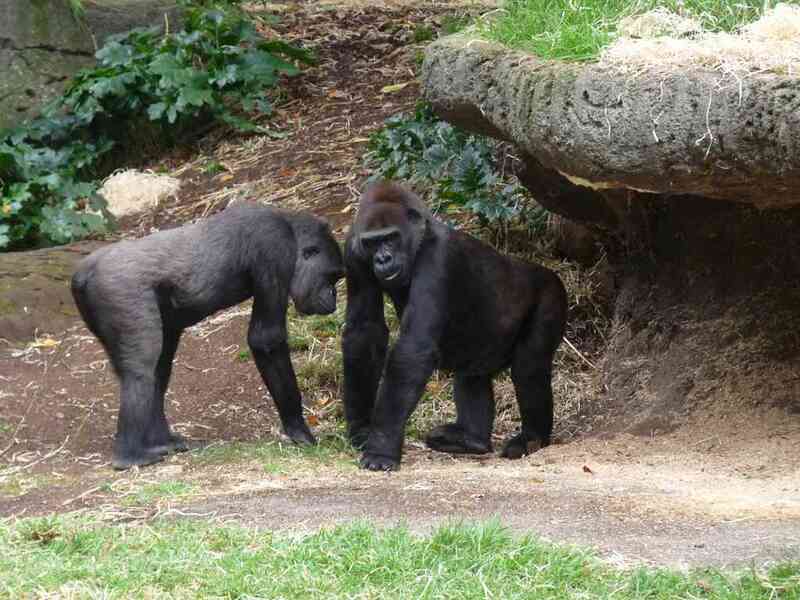 At Melbourne Zoo, I was fortunate to observe an interaction among members of a troop of Western Lowland Gorillas. The adult male silverback frequently tried to dominate another younger male who showed an interest in one of the females of the troop. The silverback is a formidable customer and he is likely to attack other members of the troop that may challenge his dominance. A few years ago, controversy broiled at the Melbourne Zoo when Otana, a young alpha male gorilla. attacked a female named Julia even as a group of visiting schoolchildren watched. Julia, who began to bleed from her wounds as the shocked children looked on, later died of her injuries. 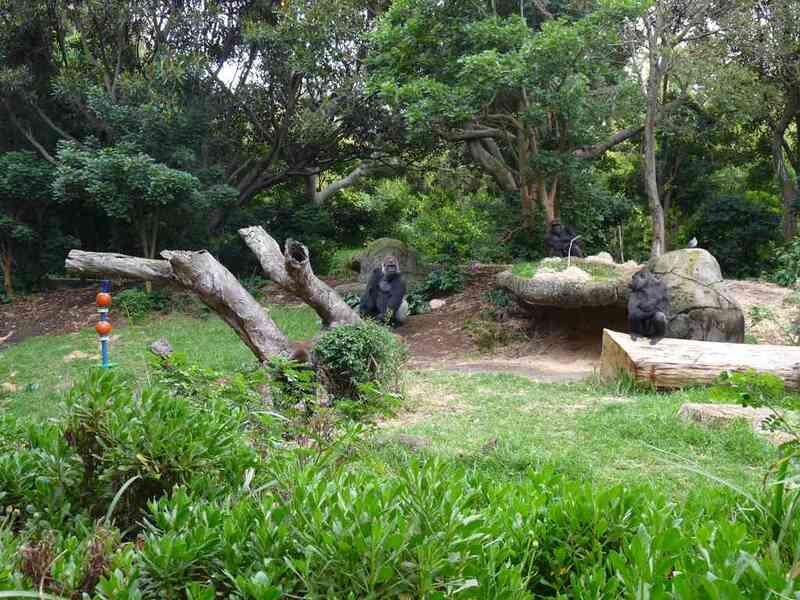 Watching gorillas at Melbourne Zoo does not appear to be fraught with danger. A strong, clear glass partition separates visitors from the apes. The partition, made of two or often multiple layers of clear tempered glass, is lab-tested to be shatter-proof and capable of resisting the impact of a wild beast’s tantrums. It isn’t the cheapest material in the market, though, and some zoos without particularly deep pockets are known to cut back on costs and used annealed glass, which is inferior in terms of strength and resistance to impact. At the Henry Doorly Zoo in Omaha, Nebraska, a young girl who was imitating a male gorilla’s chest-thumping gestures had a scare when the silverback charged her and cracked the glass. Extreme views muddy the issue regarding zoos and their role in society. To the question if zoos are necessary, the answer may be yes, if they are managed with the goal of educating the public about the risks to endangered species and sensitising people about the need to stand up and vote for leaders who can stop the destruction of forests and other natural habitats. If zoos treat inmates less as showboats and more as representatives of a tribe that should be roaming wild and free, but are not able to for reasons that humans are responsible for, then we may be close to making a difference. The loudest voices on online petition sites are often monochromatic and reactive; they are also not enduring or consistent or pragmatic in their recommendations for change. Gorillas are secretive creatures that live in remote jungles in Africa. We do not know these great apes well enough despite all the research available on them in the wild and in captivity. We could not understand Harambe’s motives and his language. So we made the choice to kill him to save a human life. One gorilla less means a lot to a global population of 125,000 that is struggling against poaching and the fragmentation of their forest habitat. Harambe the gorilla could have been the progenitor of future populations that could be reintroduced into the wild. What is the most fitting way to mourn and celebrate Harambe? Not with flowers and placards and candles, and certainly not with flaming clicktivism. Perhaps the family that got their son back should express their gratitude by leading this initiative. Can they begin by learning about the problems that confront gorillas in the wild? Can they make a sizeable endowment towards gorilla conservation? Can they evangelise the need to make zoos safer for animals and humans, both?